Do you have a broken Google LG Nexus 5? We provide repair service in Vancouver. Available in black, white and red, this device can be identified by its extra-large camera lens on the back. 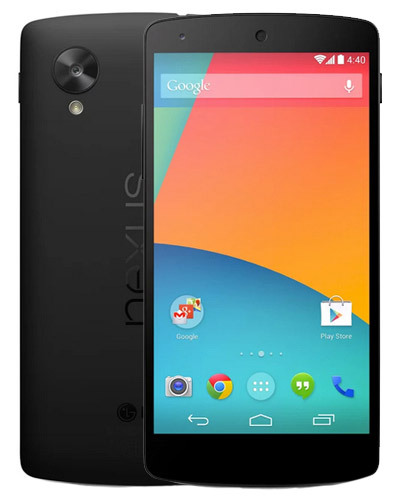 Cracked the glass on your precious Nexus 5? Not a problem! We can replace the front panel on your device right before your eyes. This repair also includes the display and the touch screen. Get your fix at our beautiful storefront location or have us come to you and fix it right at your place. It's pretty difficult to use your smartphone when the display is damaged! But not to worry - we can restore your Nexus 5 back to its former glory with a brand-new screen so you can get your life back on track. Get your fix at our storefront location or have us come to you and fix it on-site. Those buttons aren't nearly as satisfying to push when they don't do anything! Whether you are having trouble with your volume buttons or power, we got this! Due to some required soldering work, this job is offered exclusively at our storefront location. Come on in and get your fix! Having trouble with wifi, bluetooth or cellular connectivity? We can replace or repair the antennae inside of your phone to rectify the issue! This service is offered exclusively at our beautiful storefront location. Come on in and get your fix! Something strange is going on with your Nexus but the repair isn't listed here or you're not sure what is wrong. We are happy to jump on the case and help you resolve the problem. We encourage you to call us at 604-700-6049 to discuss how we can help! Let's get to the bottom of this.